Events in Nicaragua over the past week are clearly modeled on the kind of U.S.-led, NATO-driven regime change that succeeded in Libya, Ivory Coast and Ukraine, but has so far failed in Thailand, Syria and Venezuela. At a national level, the protests have been led by the private sector business classes defending their rate of profit against socialist policies in defense of low-income workers and people on pensions. Since April 18, violent protests have taken place across Nicaragua. The protests began a couple of days after the government announced proposed reforms to the social security system, which is running a deficit of around US$75 million a year. The government announced the proposed reforms following the suspension of talks by Nicaragua’s private sector business organization, Cosep. Pending possible modifications, the reforms are due to come into effect on July 1. In the protests, as of Friday, 10 people have been killed and over 80 people injured, including at least 30 police officers. Most fatalities resulted from lethal use of firearms by right-wing provocateurs. 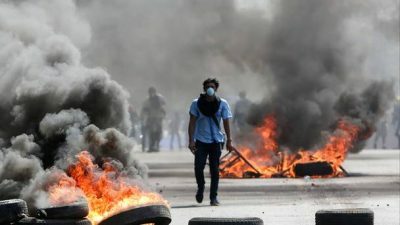 Mainstream Western media reports cover up the fact that – far from being peaceful – the protests have been characterized by lethal violence from extreme right-wing shock groups trying to destabilize Nicaragua, just as they have done in Venezuela. In response, workers and students supporting Nicaragua’s Sandinista government have mobilized against the violent opposition provocations. The protests started in earnest in Nicaragua’s capital, Managua, on April 18 and rapidly spread to important provincial centers such as Leon in the west, Granada to the south and Esteli to the north. The protests were fueled by inflammatory messaging on social networks and deliberate manipulation by right-wing media. Some right-wing TV cable media went off the air – their signal apparently having been deliberately taken down – without any clear, independently verifiable explanation. Apart from the deaths and injuries caused by the violent opposition protests, widespread damage was caused to infrastructure, including local Social Security Institute offices; municipal authority offices in Esteli and Granada; university buildings in Managua and Leon; Sandinista party offices in Chinandega and Masaya, and government offices in Managua. There, too, opposition gangs tried to enter and destroy the brand new ‘Denis Martinez’ baseball stadium; the brand new Fernando Velez Paiz Hospital, and the Institute of Social Security head office. The gangs also attacked most of the Sandinista-aligned radio stations, including Nuevo Radio Ya and Radio Sandino, trying to set them on fire. A group of more than 100 protesting students retreated from the main university area in Managua and took refuge in the city’s Catholic cathedral. The police contained them there until their peaceful departure was negotiated. Further afield in Nueva Guinea, towards Nicaragua’s Caribbean Coast, an opposition gang attacked a cultural event held in support of the government, wounding various government supporters. In many places, gangs of opportunist delinquents have intermingled with the political protests, which have also involved attacks on commercial business premises and vehicles, as well as bystanders not involved in the protests. While the private business sector organization Cosep has called for peaceful demonstrations, extremists from the right-wing Citizens for Liberty and Sandinista Renewal Movement political organizations have led the violent protests. They have made effective use of social networks, spreading false information and inflammatory accusations so as to confuse and mislead people – especially young people – who know little or nothing about the Social Security reforms, which have turned into a mere pretext for violent protests aimed at destabilizing a government which enjoys overwhelming electoral support. Both evangelical religious authorities and the Catholic church hierarchy have urged calm and called for dialogue. Cosep has insisted that people protest peacefully and called to reopen talks on social security reform with the government. The army and police completely support the government, and the police have acted with restraint in the face of lethal provocation. Trade unions and the main student organization have condemned the violence and expressed support for the government’s proposed social security reforms. The Union of Older Adults, which lobbies for better pension rights and health benefits for older people, also supports the proposals, which include a five percent deduction from older people’s pensionsin exchange for full rights to the same healthcare as active workers. After Nicaragua’s right-wing parties won the national elections 1990, the three subsequent right-wing governments mismanaged the Social Security Institute (INSS), cutting back coverage and reducing benefits. During the same period, millions of dollars of INSS funds were misappropriated to fund private sector businesses and make illicit payments to individuals. When a new Sandinista government took office under President Daniel Ortega in January 2007, the social security fund had an unsustainable deficit and a much-reduced contributions base. Since then, the INSS has increased the number of people covered by social security and also extended the benefits the system provides. These now include hemodialisis, oncology therapies, spinal surgery, ophthalmology, neurosurgery, hip and knee replacements, kidney transplants and other very expensive, specialized procedures. President Daniel Ortega has confirmed the government will continue discussions with Cosep, the organization representing Nicaragua’s private sector business, as well as the other organizations taking part in the talks about how to defend the sustainability of the INSS. Disturbances continue in various parts of Nicaragua, with more deaths and injuries being reported. Church representatives, business leaders and political figures are calling for an end to the violence. For the right-wing political groups provoking the violence, the INSS reform is simply the opportunistic pretext of the moment, but it is unclear whether they aim to cause longer-term destabilization. The pattern so far is similar to events in Libya, Ivory Coast, Syria, Ukraine, Thailand and Venezuela. In these countries, extreme right-wing political minorities conspired with foreign elites – mainly in the United States and Europe – to overthrow the national status quo and take power. In Nicaragua, the small, minority right-wing political opposition have openly sought financial and political support in the United States and Europe explicitly to undermine and destabilize Nicaragua’s Sandinista government. The obvious model they are working from is Venezuela. The next couple of weeks will tell if Nicaragua is going to suffer yet another U.S. intervention with all that implies for the country’s people and the region.